The SEVEN SEAS sails different routes in the Red Sea, that all contain fascinating Diving areas. Depending on the chosen route, the below described diving areas can be visited. The Brother Islands (Arabic: El Achawein – The Brothers) are small islands built by tectonic activity in the middle of the Red Sea, far from the routes of the day boats. The “Big Brother” is equipped with a lighthouse. 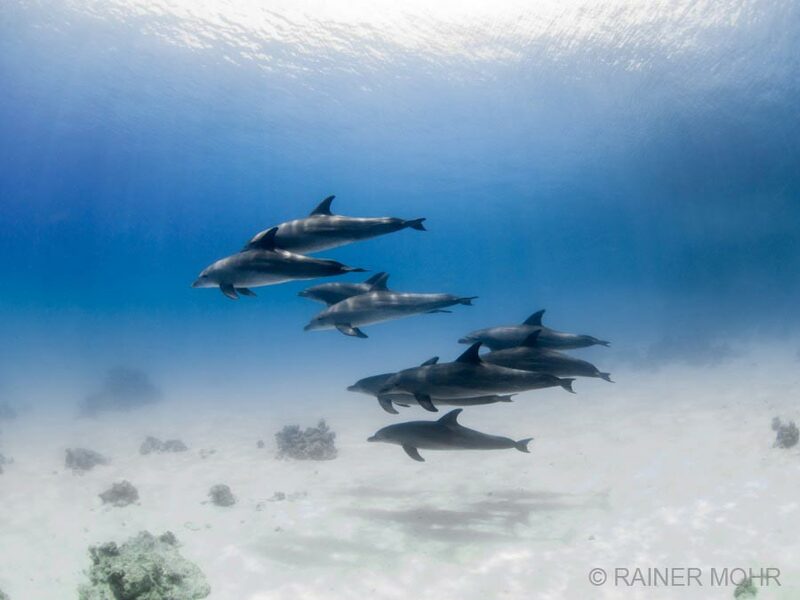 Underwater, the brothers are among the best the Red Sea has to offer. The wrecks of Numidia and Aida in the north are covered with dense soft corals, in the blue water sharks or large tuna fish often swim by. Loading of the wrecks is scattered everywhere. But the Brothers are more famous for their shark populations. Gray reef sharks, Oceanic Wite Tip sharks, Thresher sharks, Hammerhead sharks or Silky sharks. A good place for Thresher sharks is the southern plateau in the morning, where they regularly visit the cleaning station. 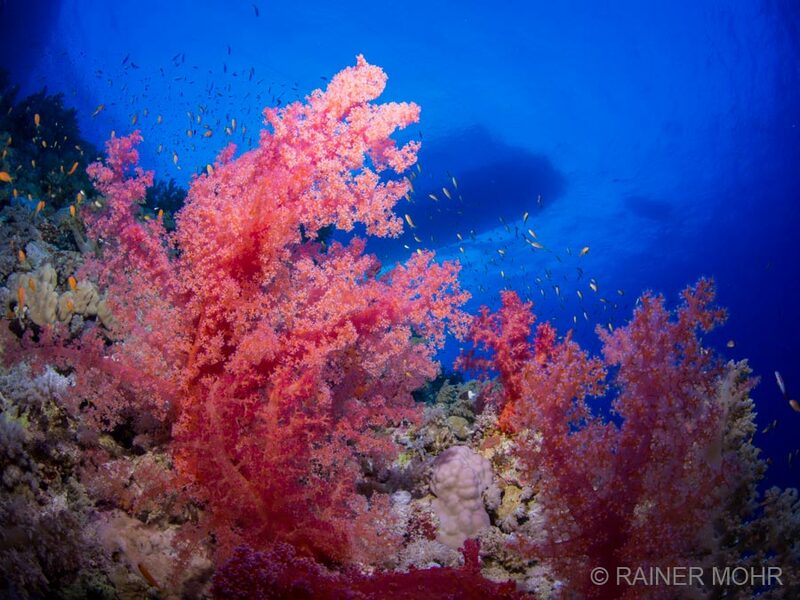 The “Little Brother” is almost more beautifully overgrown and covered with colorful soft corals. A cleaning station on the northern tip also attracts sharks of all kinds. Abu Kizan, so the Egyptian name, is a large, almost circular reef, about 200 nautical miles south of the Brother Islands. Although it has no actual land, a lighthouse was built on the reef to warn the ships of the nearby shipping route. Daedalus is large and beautifully covered with hard and soft corals. The dive groups are scattered along the reef, keeping nother groups further away. A long plateau in the south of the reef has already enabled the other Manta encounter. The highlight of the Daedalus is the resident Hammerhead shark school, which is mostly located in the north of the reef. 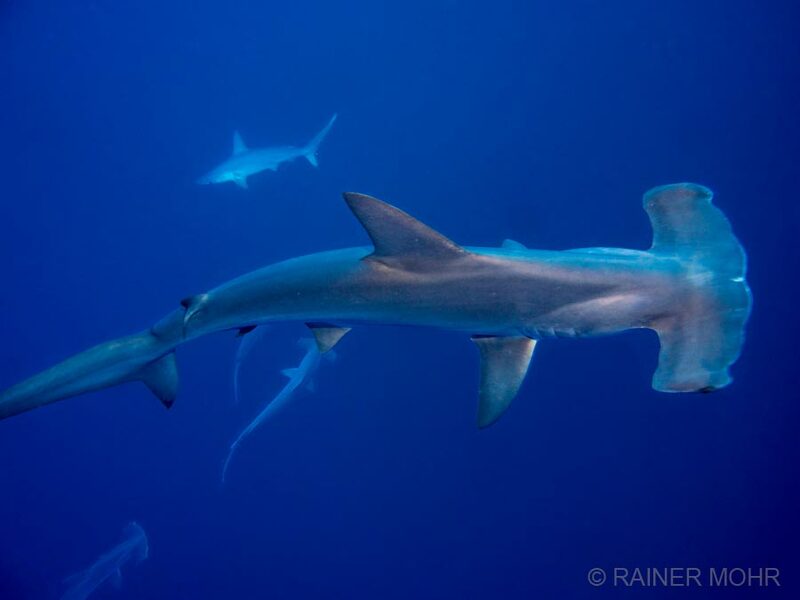 Also, individual hammerhead sharks are regularly sighted in the blue arounf the reef. 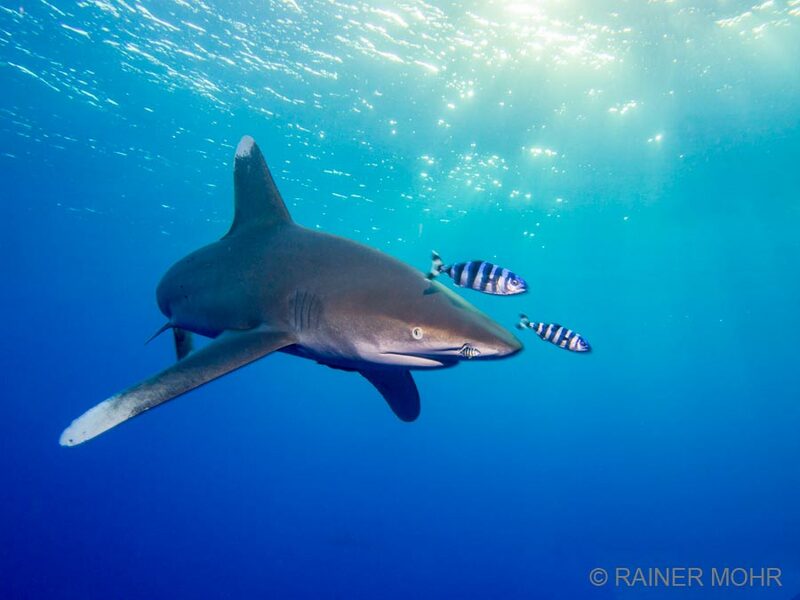 Also Thresher sharks, Oceanic Whitetips, gray reef sharks, silky sharks and occasionally a tiger shark. The reef group of the St. Johns reefs is located below the peninsula of Ras Banas in the deep south of Egypt. Many single large and small reefs rise from the deep ocean and are gradually approached by the SEVEN SEAS. Among them are wall-like dropoffs as well as shallow coral gardens on sandy grounds. The vegetation is colorful and healthy, huge coral formations, colorful soft corals and fabulous landscapes make the St. Johns reefs special. 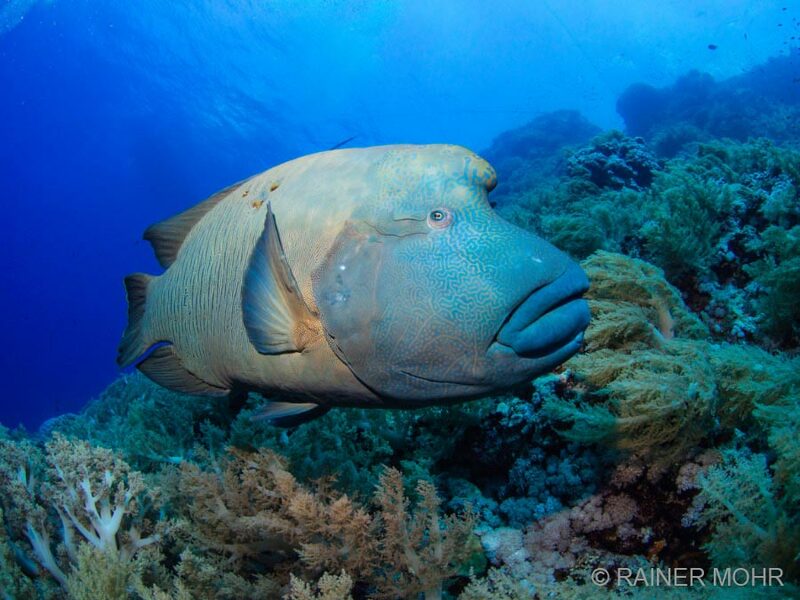 A little less big fish, but therefore incredibly diverse reef dwellers let the photographer’s heart beat faster. Very special is the Cave Reef system. Many dives can be done in depths of only a few meters in the caves, which are illuminated by the rays of the sun coming through the cracks in the ceiling. Also mantas and dolphins can be seen here from time to time. One of the most famous reefs of Egypt is the Elphinstone Reef, which is located near Marsa Alam, which is approached on many tours on the first or last day. A long reef with a plateau on the north and south side. 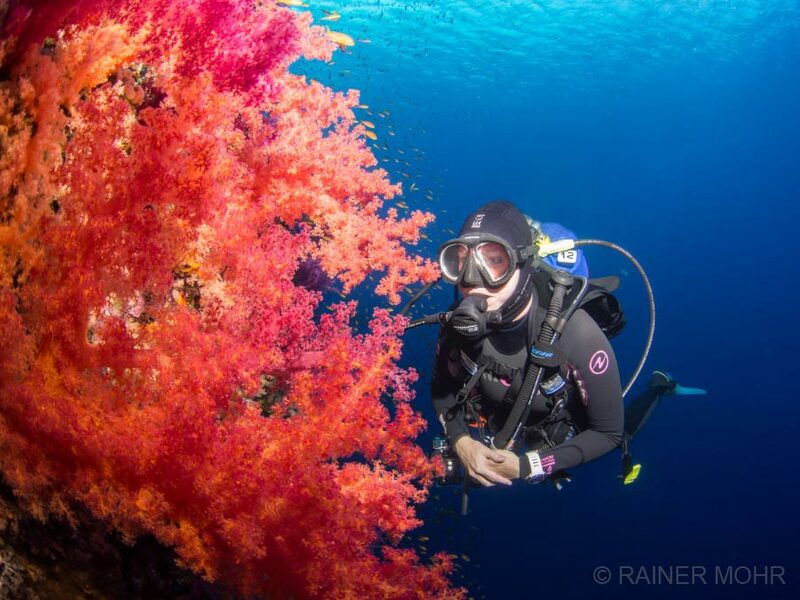 Both plateaus are wonderful to dive and the whole reef is characterized by soft coral growth in every imaginable color. The long Norplateau can not always be dived due to excessive currents, but offers unforgettable moments when one glances over the top, hovering in the blue to see a shark. All kinds of sharks have been seen on Elphinstone! The southern plateau is directly below the most common anchorage and can be easily dived from the boat. 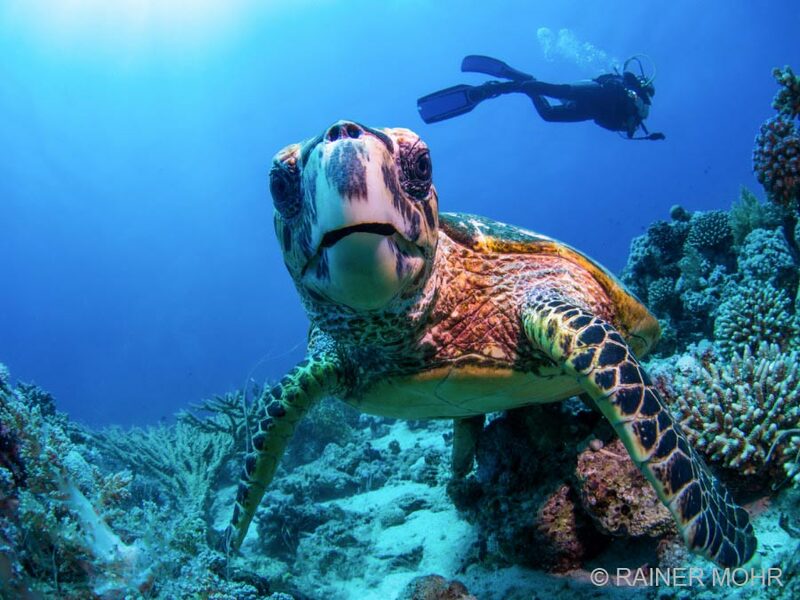 There are often also turtles and the usual colorful reef dwellers. 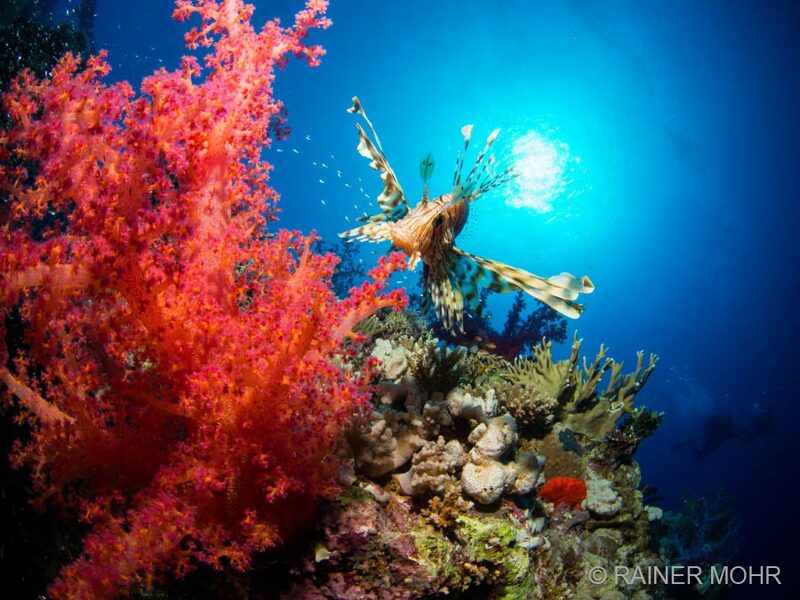 The southernmost reef area in the Red Sea! 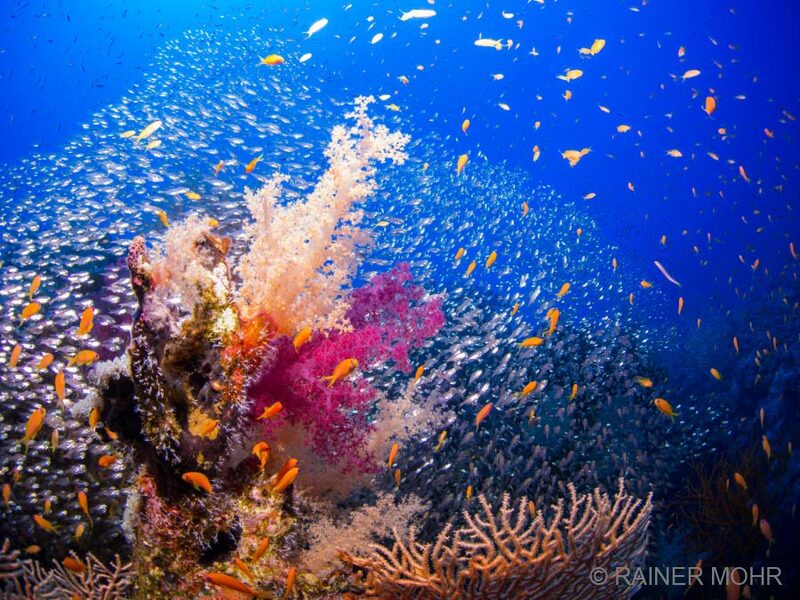 Just above the Sudanese border, the most untouched dive area to be reached from Egypt covers many kilometers of reef. Abu Fandera was rediscovered only a few years ago by questioning old fishermen for particularly fishy and far-away reefs. In Abu Fandera there are still many undiscovered dive sites, so that every Abu Fandera tour can also be an explorer tour. Many reefs here will see a diver for the first time. Predominantly patches of reefs and fairytale landscapes as well as dropoffs in clear water with great fish richness make an Abu Fandera Tour something very special. Above the peninsula “Ras Banas” is the reef area of ​​the Fury Shoals. Mostly beautiful coral gardens with many small and large “ergs” (coral towers), caves and magnificent vegetation make the Fury Shoals an easy, diversified dive area. Turtles, napoleons, the usual colorful reef dwellers and also dolphin schools lure the experienced diver into the water again and again. The Fury Shoals can be easily combined with Southern Tours like St. Johns, Rocky Island or Zabardgad Tours. Yolanda reef, a reef with the wreck of a ship, that had countless sanitary items (bathtubs, toiletries, etc.) loaded, which are now scattered across the plateau. Anemone City, a large plateau stretching in the blue water with many anemones. Everywhere on the Ras Mohammed the view into the blue water is worthwhile, because of the huge fish swarms, which are permanently there (snapper, batfish, mackerel, u.v.m). A small island east of the St. Johns reef group and within easy reach of the much larger island of Zabarghad. The island itself is a barren, inconspicuous and sand-colored rock in the middle of the ocean. But this impression changes considerably below the surface of the water! Steep walls with small caverns and giant soft corals of all colors that stretch into the current. Deeper caves and bizarre landscapes on the south side. Rocky Insland is definately good for several dives! In the last few years Rocky Island has even seen tiger sharks lurking on the turtles that are frequently found there. A small beach on the island is used by sea turtles for laying eggs. A several kilometer large island east of the reef group St. Johns with many worthwhile dive sites. In the south of the island, a turquoise lagoon stretches to the fringed reef, which has beautiful coral gardens on the sea side and a lively plateau, as well as many winding caves. The island itself is a bird sanctuary and therefore can not be visited. The east side of the island a large, unknown wreck awaits divers, and almost reaches the surface. On the Westseite again fabulous, healthy coral landscapes on sandy ground. Zabargad has also seen several tiger sharks in recent years. 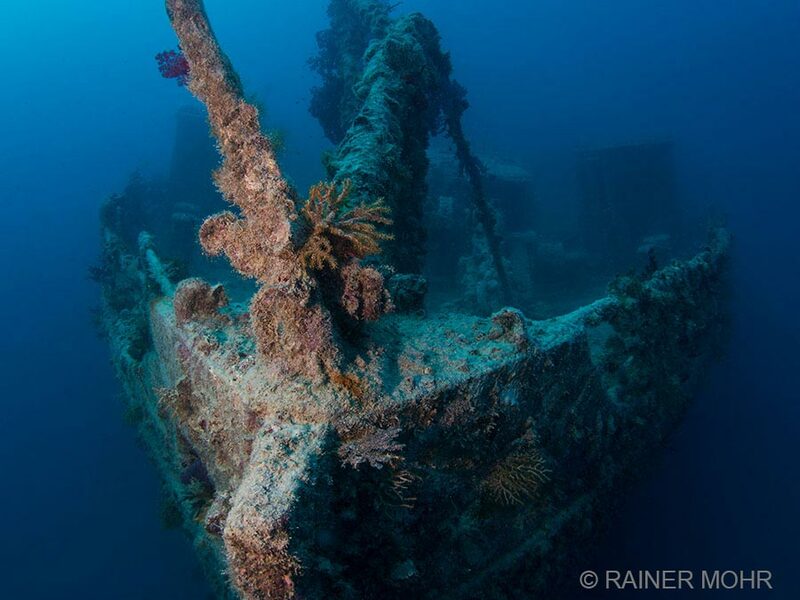 The northern area of ​​the Red Sea is mainly known for: wrecks! The tours are often started at Shaab el Erg (Dolphinhouse) where you can dive with the local dolphin school if you are lucky. The reef Abu Nuhas with its four wrecks Giannis D., Krisoula K., Kimon M. and Carnatic. The famous wreck of the Thistlegorm, a freighter with railways, hundreds of motorcycles, vices, cars, weapons and a huge amount of amunition, also sunk in the second world war. As well as other wrecks like the Kingston, the Dunraven and many others. On the last day reefs near Hurghada are on the itinerary.